Age: Old... very old. Just look at the names. Estimates place him at about 3,000. It is rumored that Donovans original body was destroyed long ago, but his spirit has endured, jumping from body to body. This rumor is based on his long life. Evidence of his possession of the body Desperado shows that he cannot use some of his physical abilities such as half shifting, or becoming human, thereby indicating the false nature of the rumor. Human: Caucasian, 6'1", hair color varies, looks a little like Vash the Stampede... only not as funny, and much more pissed off. Black leather trenchcoat with a higher collar, typically wearing all black. Born as a full blooded Werewolf, is not a half-breed. This is a mystery as of to how this is possible. Being a full blood, his mind is present in all forms, there is no savage animal. Enhanced strength, speed, agility and senses. Wolf: Multicolored coat- Grays, browns, blacks and whites, some gold highlights.Larger than a normal wolf. Extremely agile and fast in this form, achieving speeds over 100 MPH. Tends to be damn near impossible to catch. Werewolf: Height:13 feet. Easily five times stronger, faster, smarter, than any werewolf, his scenses are also extremely sharp. In this form Donovan can utilize all of his abilities with greater effectiveness. His weapons and clothes seem to vanish as he changes, and reappear upon changing back..
Wolf Lord: Donovan IS the first Lord of all Werewolves to ever exist and has held the title for thousands of years until Desperado came along. Even though Desperado is currently the Wolf Lord, Donovan was the first, thereby gaining automatic respect and recognition. With this title, he is automatically respected... and feared by all wolves and werewolves. He can command them without question. All his normal werewolf abilities are enhanced as well (Speed, strenght, scense, healing). This title also allows him to be in full control in all forms as well. All though silver is still a threat, it is signifcantly reduced, only causing a slight burning pain in the area of contact. Once the silver is removed, the wound will heal. As the Wolf Lord he is more than a match for any demonic force, vampire, and can sustain himself well in a battle against many opponents. In human form he carries a simple saber which is mostly decorative, but leathal none the less. Sword: Plaga De Lupo- Wolfs Bane. Donovan forged this sword thousands of years ago using the most Arcane of techniques. A sword specifically designed to kill Werewolves. Any Werewolf who touches it will instantly ignite in to flames, and there soul will be absorbed by the sword. Any Wolf who is cut by the blade will experience searing pain and the wound made would be courterized from heat. Also grants the carrier of the sword Ethereal Fire, however this is a technique that takes a lot time of time to access and control. The souls housed within the sword are controlled by the weilder of the sword. Imbued on the sword by Desperado, are hidden runes that can create a powerful protective shield. The runes can power the shield for a limited time, however by infusing it with his energies, more particularly his Ethereal Fire, or a wolf spirit, the shield becomes immensly strong and powerful. Busqueda: Busqueda, spanish meaning "to search". (Name given to the dagger by Desperado). Busqueda is an enchanted knife that can detect any being other than human (Vampire, werewolf, Succubis, etc.). The blade can be used to track as well. Its abilities only work for the bearer if it is passed on to the them, not taken. The blade can also prevent, stop, or revert the transformation of any werewolf. It will also protect the bearer of the blade should they become threatened. When used in conjuction with the Sword, it can be used to create various summoning, enchanting, or de-spelling abilities. Practitioner of various Dark Magics. Chronomancy Protection: Spirits are immortal, they exist outside of normal time and space. This has given them the ability to protect Desperado should he be the victim of a time spell, protecting him in there most powerful form. Being Bonded to his spirit, he can continue to command them, seeing all that happens as he is frozen in time. In this instance, the spirits are at there most powerful and can overwhelm nearly any foe. Ethereal Fire: Controlled by his thoughts, the fire glows a brilliant blue and is fueled by Donovans emotions and intentions. With the sword Plaga De Lupo, this ablitity is enhanced. The flames will cause burn damage only if Donovan wants them too. Being ethereal, these flames can be as potent as hellfire when fully charged. These flames negate the effects of any other flame that would hit him, and offers some protection against explosion (only explosive force and shrapel would be felt.) Donovan is also capable of throwing the fire in several different forms. When the fire comes in contact with something it will stick to it and burn. Being that the fire is Ethereal, it has an effect on Wraith like lifeforms. It also cannot be controlled by others as it is an extention of Donovans being. By a simple thought, he can increase the heat of his flames, as well as there level of brightness. Another ability that he has with his flames is the capability to infuse it with wolf spirits, thereby making it more intense and powerful on all levels. Claws: His werewolf claws are acceptionally sharp, able to rend through many types of armor and stone. His claws act as a focusing point, allowing him to throw out claw shaped blasts of energy at his opponent. Teeth: Being a werewolf, Donovans lined with razor sharp teeth, stronger than his claws. Having a bite force of 3,500 lbs, he can crush nearly anything. Unique to his bite is the ability to control whether or not he infects a person with the lycanthrope virus. As an alternative, Donovans salive acts as a toxin, causing an extremely disorienting effect and draining effect on those he bites. This is a trait that seems to be inherent only to a Wolf Lord. Has found a way to control the transformations in other Werewolfs. It is not determined if this is due to magic, or some other means. Like all of his kind, all his scenses are extremely heightened. It is rumored that this occurs when he places his mark upon them. Evidence against this is found in battle against Desperado, where in he casued Desperado to change without ever touching him. To the people of the Mediterranean he is Cerberus, the Demon of the Pit. To the Egyptians, he was Anubis. The Ancient Celts called him Cunobelinus. To the rest of the World, he is the true Hell Hound. Whether human, wolf, or Werewolf, he is feared. None of the Lycan (yes I said Lycan) kind will cross his path, his wraith is feared by all. Blindingly fast, immensely strong, he makes any Werewolf look weak. They will follow him. He won't give them a choice. Having existed for thousands of years no one truly knows who he is, although his human form suggest he is of European Decent. As previously mentioned, he is known under several mythological and Religious names. This has lead many to believe that he is in fact Anubis, the God of the dead, and the Hell Hound. When compared to his powers, it would make logical sense. In Egyptian Mythology, Anubis was the Lord of the dead. Having amassed such power in his time, he was always feared and respected. For a time, he served under Count Nivaria as a General, commanding the werewolf legions. Donovan holds great respect for Nivaria. The nature of there dark relationship and how he became employed by Nivaria is still a mystery. The beginning of Donovans downfall occured when one of Desperados ancestors stole the Wolf Bane and his dagger. Enraged by this, he pursued his clan, plagueing them for years with attack after attack. Finally finding Desperados family, he slaughtered them, only to learn that one hand survived. He continued on and finally found Desperado, the Mariachi. The two crossed paths several times, each time Donovan toyed with Desperado. During a battle, Donovan was run through with his own Sword, The Wolfs Bane, and his soul was absorbed by Desperado. Still alive within Desperado, he plots his return, waiting for the the day to destroy Desperado and his lover Tora Belmont, and freeing the world from the plague that is mankind. Thousands of years ago, before humans used language to describe the events of the past, the Earth Mother created three supernatural forces - the Weaver, the Wyrm and the Wyld - to maintain the universe. She guided all nature's creatures with a feral claw. It was the Earth Mother, they say, who first taught us to change our shape. And it was at Her command that we fostered the fledgling human race. 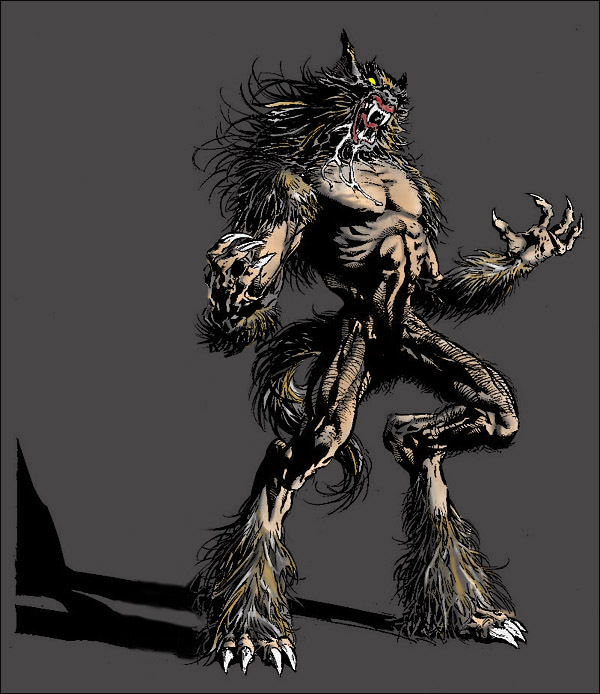 Many were the shapeshifting kinds, but we were the most powerful, the most feared - the Lycan, the Werewolves. Together, we kept the human herds in check. A conclave of our tribes ruled our kind, and we were the Earth's dominant species. We reveled in our dominance, and we sought to govern all shapeshifters. When not all would bow to our might, we claimed our kin to be a threat to Gaia's human children. In retaliation for their defiance, we waged a savage battle against our changing kind. We never expected that those we sought to protect would be the next to dissent. The violence was so terrible that humankind turned its back on us all. While we carved out a path in blood, humans relegated us to myth and legend and began their own story. So much did humankind deny our existence that, to this day, humans who see a Lycan retreat in madness and forget what they have seen. Today, we Lycans live under the Veil, concealing ourselves from the humans who are now dominant among Gaia's offspring. But still, be it in the world of flesh or spirit, we fight to prevent the Apocalypse. As humans pollute the world and cities grow, strangling the wild places, so too do the Wyrm and the Weaver fight each other in a conflict that can only destroy the world. We Lycans stand in their way.